Similk Bay is the northern end of Skagit Bay in Puget Sound. Some of it is lined with beach-front homes, but there are sections of shoreline which are still wild and pristine. 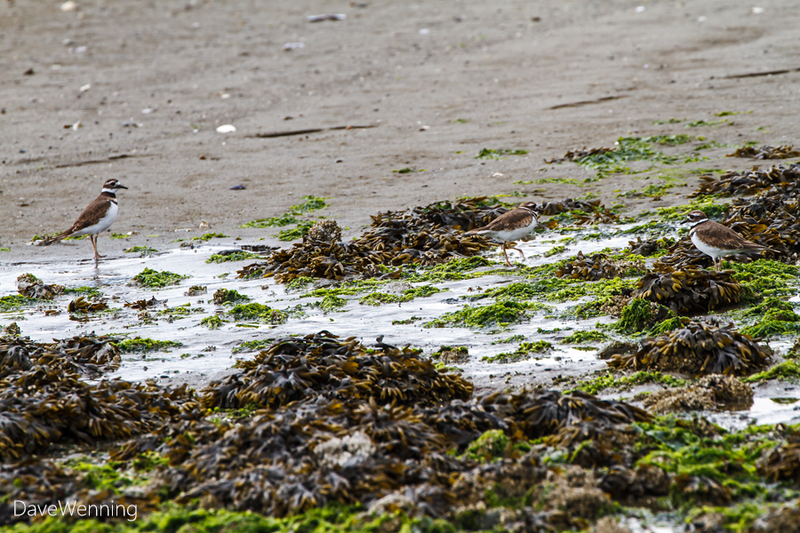 Beachcombers can expect to find unusual plants and a rich habitat. On Labor day, I spent the morning hiking into Similk Bay. The previous post brought us here. Now we will turn around and return home. 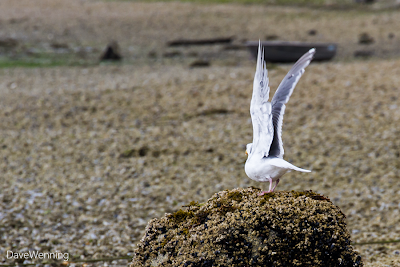 There were dozens of Glaucous-winged Gulls working the shoreline during my visit. This one was taking a rest on a barnacle-covered rock. Liftoff! The human got too close, so the Gull decided to skedaddle. On the way back, I spotted my new friend again, still in the same location. The injured juvenile Gull from the last post was checking a bit if Eel Grass for tidbits to eat. I might try and return in a week or so to see if he is still around. Someone in the neighborhood has been clam digging and left this pile of shells. 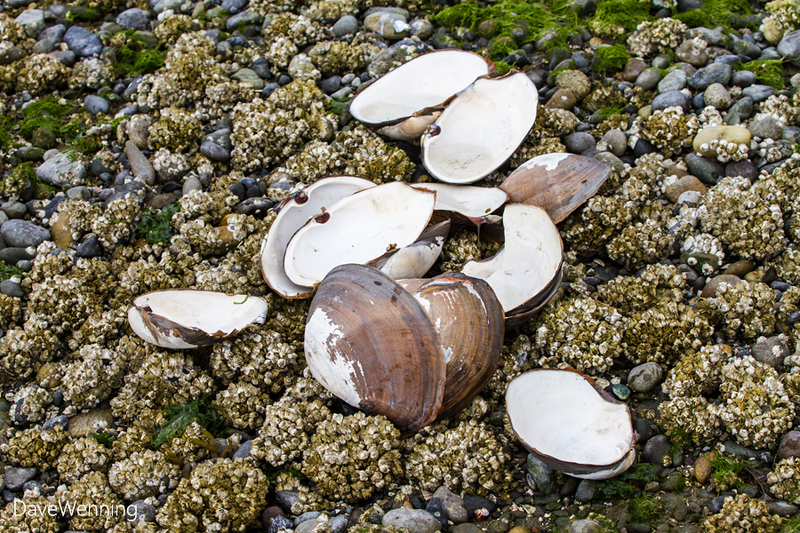 These are Horse Clam shells (Tresus capax), also called Fat Gapers. 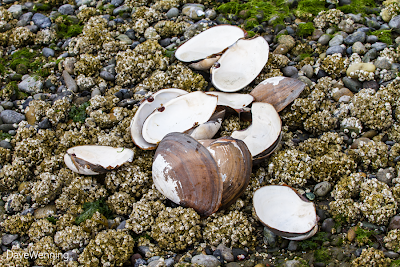 These are big clams, 6-8 inches (15-20 cm) wide. They are not highly favored by aficionados, but they do make good chowder. Something I did not expect to run into was this American Robin (Turdus migratorius). I also featured this bird with the unusual habitat in a post over at Wild Fidalgo. 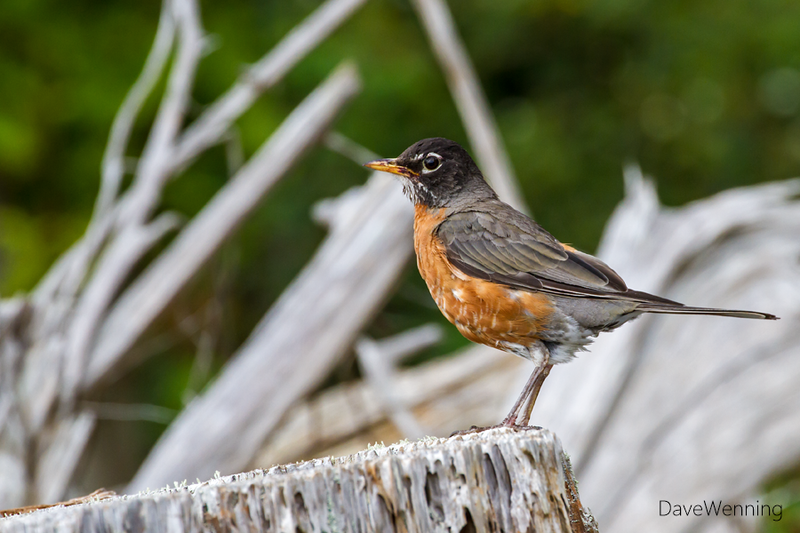 This is a bird of gardens, parks and open woodlands and not typically seen at the beach. 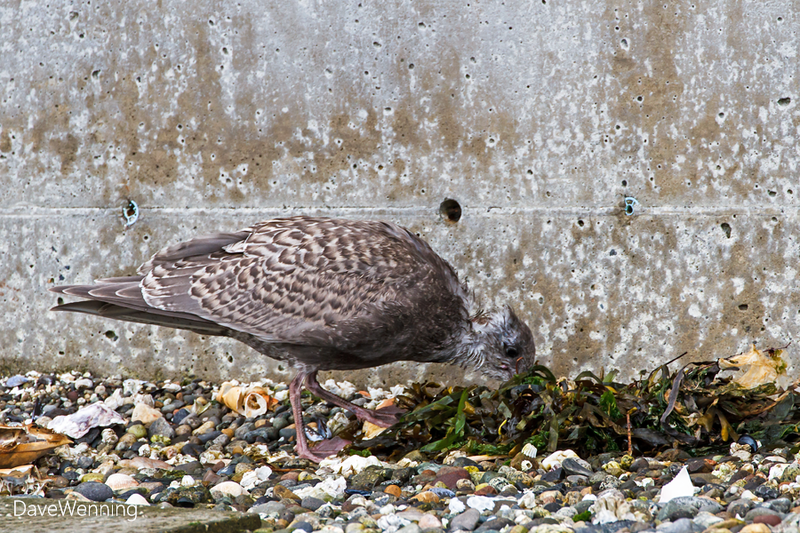 Despite my surprise, he seemed very much at home foraging around the driftwood along the shoreline. 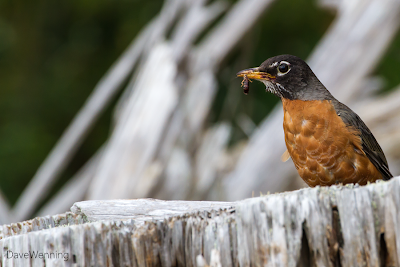 He proved to me that he knew what he is doing when he caught this bug in the rotted core of a driftwood stump. 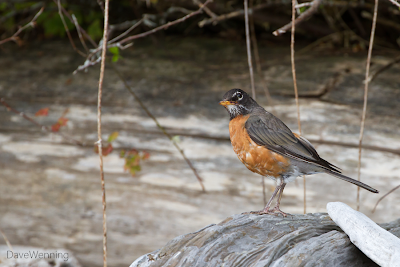 The stains on his beak reveal that he had also gotten into those ripe Himalayan Blackberries we saw in the last post. Killdeer (Charadrius vociferus) are year-around residents on Puget Sound beaches. I saw a lot of them during this hike. Can you see three in the photo? 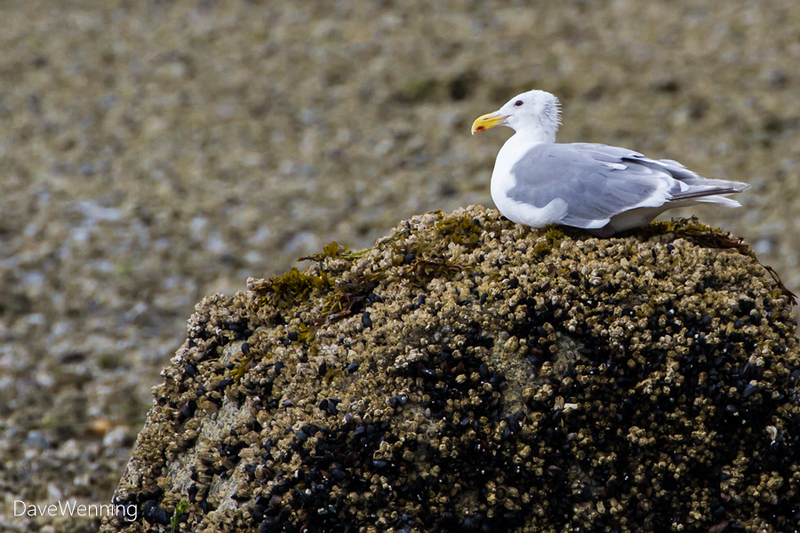 They are very hard to spot on the beach until they start vocalizing. They are also hard to photograph because they always seem to be moving. I wish I could have composed this photo a little better. 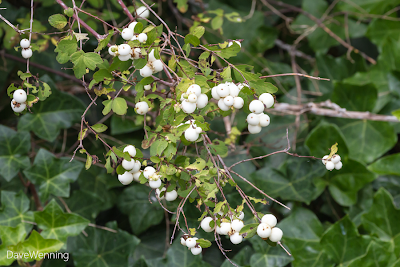 Back on my own beach, these ripe, wild Common Snowberries (Synphoricarpos albus) are growing on the bank. They also come up in other parts of the yard where I just let them have their way. 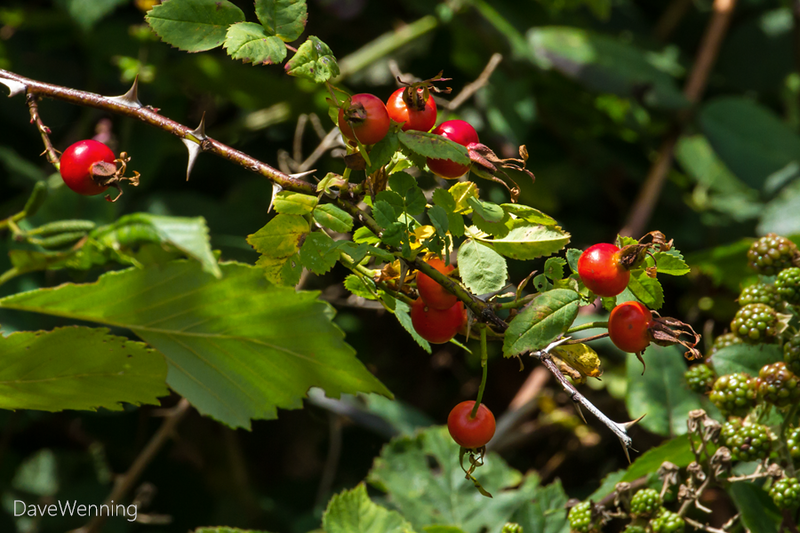 This is a very nice native shrub for the Northwest wildlife garden. 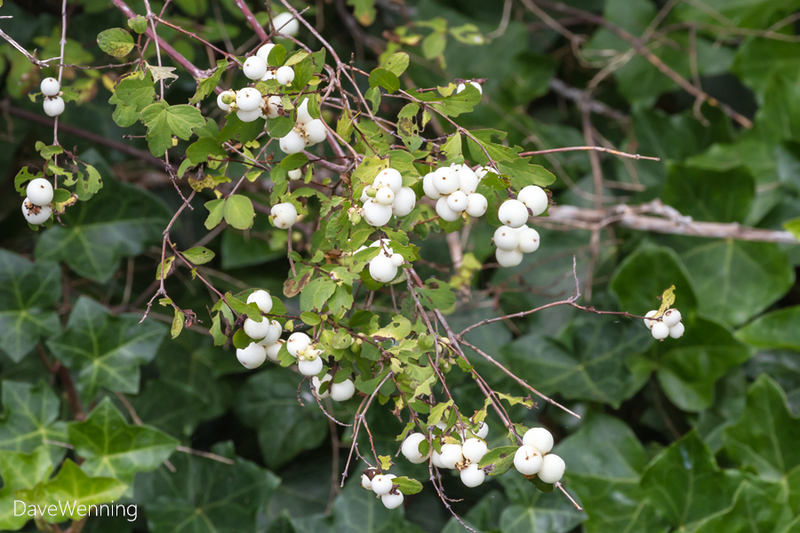 This time of the year, those pure white berries sparkle in the green foliage. Nootka Rose (Rosa nutkana) also grows on my bank and is one of the best shrubs for stabilizing slopes. It is also an unsurpassed native plant for attracting wildlife. They are setting those brilliant red hips right now. During the hike home, the morning overcast cleared and the sun came out giving us a very beautiful Labor Day holiday. I took the opportunity to make this photo of my weather station anemometer mast. 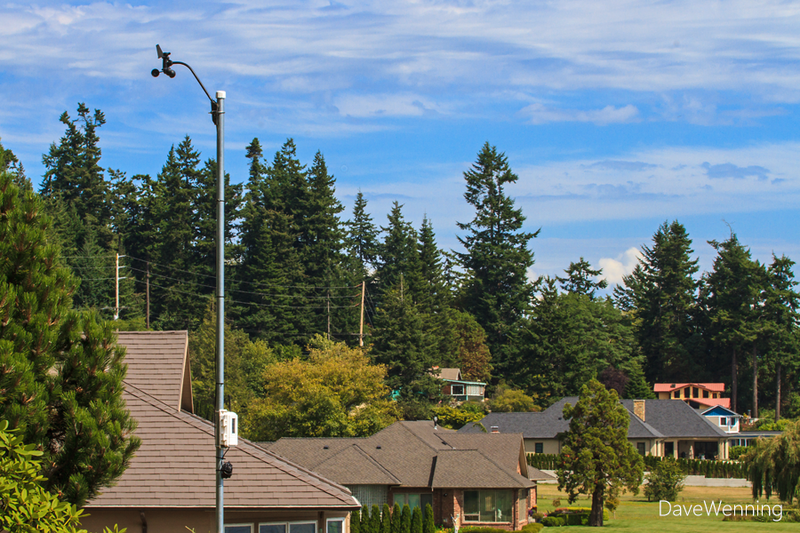 I want to use it as a station photo at Weather Underground. 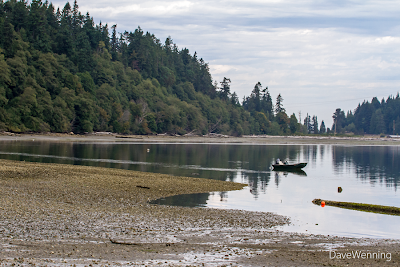 Exploring the beaches around Fidalgo Island is one of my favorite pastimes. I was very pleased with the results of my Labor Day hike. Even a leisurely stroll on our rocky beaches is a good workout also. Every step is on unstable ground with the rocks rolling underfoot. All of the stabilizer muscles in the feet, hips and torso come into play. I could feel the effects that evening. It was a perfect holiday.